For your reading pleasure, this week's Retail Experience in the News... The latest articles and links from the week and shared on Twitter with the #retailexp hashtag. Would you agree that this is the retail experience idea edition given the large number of references in that category? Getting customers to return after a deal http://bit.ly/alodth Valid #retailexp online and in-store! Apple & Container Store: 2 examples where passionate employees make difference #retailexp http://su.pr/4ouqwJ - Yes, my post! Per eMarketer: reach women online with money-saving offers http://bit.ly/d9O8jq (expand ) what has worked for your #retailexp? 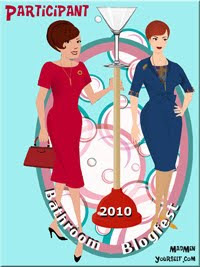 From 2006: Fashion Statements #retailexp http://bit.ly/doR23N Still true today, no? New #retailexp option: textbook rental for students http://bit.ly/9poGi3 Can we take similar approach in other categories? For previous issues of Retail Experience In The News, see Part I, Part II, Part III and Part IV. As consumer expectations for the retail experience - and more specifically for how social it is - increase so, too, does a company's ability to attract, train and retain competent, brand enthusiastic and customer-focused employees become more critical. Let's face it: passionate employees differentiate a retail experience. First, from the perspective of an employee as described in this Fast Company article from November 2007 titled Magic Shop - Apple Employees. The author, Alex Frankel, experienced life on the retail front line at several prominent retail brands. Only the Container Store and the Apple Store were consistent in identifying potential employees who were passionate about what they were to sell. Apple's approach to selling consisted of "position, permission, probe." In the author's words, "when employees become sharers of information, instead of sellers of products, customers respond." The results at Apple: "Apple employees help sell $4,000 worth of product per square foot per month." Highlights: Apple treats employees like adults; it teaches employees how to work together and requires that employees wear signature t-shirts and lanyards. Employees also hand out business cards. They enjoy working at the Apple Store. Next, from the perspective of the retailer as described in Three Good Hires? He'll Pay More for One Who's Great from the 3/16/10 issue of The New York Times in an interview with Kip Tindell, chief executive of the Container Store. Kip refers repeatedly to the importance of Foundation Principles for capturing the essence of the Container Store experience for employees and developing a cohesive team. "We believe in just relentlessly trying to communicate everything to every single employee at all times, and we're very open. We share everything. We believe in total transparency." Furthermore, "one great person would easily be as productive as three good people." They are paid 50 to 100% above the industry average. In the interview, Kip explains how destructive to the company culture and retail experience hiring people who aren't "appropriate culture fits.. We were just hiring anybody...It wasn't the same culture or the same customer service level..."
In both cases, the resulting retail experience is one that customers truly enjoy -- all because employees are passionate and genuinely care about customers. It is differentiated. How do you attract, train and retain talented employees so your retail experience remains truly differentiated? For your reading pleasure, this week's Retail Experience in the News... These are the latest articles and links I came across this week and shared on Twitter with the #retailexp hashtag. Biggest surprises: the number of articles discussing consumer spending and Christmas in July, despite talk of Halloween! Preliminary July consumer sentiment weakened to lowest in 11 months http://bit.ly/c0qnjQ How will that affect #retailexp? The new luxury redefined into 'functional' luxury http://bit.ly/aYVdz1 How will this affect your #retailexp? Were U aware that Halloween is more popular w/adults? Victoria's Secret has plans http://bit.ly/bhR56m How do U relate it 2 yr #retailexp? Creating a memorable #retailexp in-store vs. outdoors from Bass Pro http://bit.ly/bMSdxt Priceless! For previous issues of Retail Experience In The News, see Part I, Part II and Part III. Back in August 2007, I received an email from a flooring retailer in the midst of moving an existing floor covering store to a new location. Inspired by Don't Compete on Price, he hoped to design a space that proclaimed to customers in no uncertain terms how passionate he was about helping them feel great about their home. He wrote: "I watched the Cisco clip on your blog and agree with Pamela Danzinger’s advice. The million dollar question is how to achieve this goal with a limited budget? I find these “big picture” ideas easy to agree with but am stumbling with how to implement them." I recently found my email response and thought I would share it with you here. I do believe you can achieve a retail experience that doesn't compete on price with a limited budget. Great retailing is a blend of common sense, a strong focus on the customer and creativity. Here are some initial ideas to react to. Look at what other stores that redefine categories have done. Take a walk through Urban Outfitters or Anthropologie [they disavow direct selling]. Also, Starbucks, Barnes/Noble and Apple Store. Observe how those stores merchandise their products, appeal to the senses, use color on the walls, create interesting juxtapositions, etc. [The July 23/30 issue of Floor Covering Weekly has my latest article "Feasting the senses"; I use some of those stores as examples.] They've created spaces where people want to linger, which is what flooring stores haven't yet done successffully. Note that no two Anthropologie stores are laid out the same -- which tells me that any layout can work. Definitely plan on having several spaces in the store with tables/chairs where consumers/designers can sit and explore ideas [I have a blogpost in the works about the importance of having 'fitting rooms or dressing rooms' or space to try on ideas]. In those areas, try to include peg boards or bulletin boards to put up design inspiration images, color stories, fabric swatches, etc. The nice aspect of the tables/chairs is that they can be the focus of private alcoves around which you can group product displays. That prevents your showroom from looking like a sea of rows of racks. Plan on leaving lots of space in the store, to get around easily, and space to showcase new ideas/products. [See A Store That Floors: Aggieland Carpet One Floor & Home. Ron and Claudia Smith have displays on wheels; he creates trends or concept boards and rotates those on a weekly basis. Create boards that integrate soft flooring with hard surface, add some paint swatch ideas, maybe some fabric concepts. Can you get your store associates to help create a strong design sense for the store? Or having a contest with local design students to showcase design ideas? [That also gets you some local press attention.] If you haven't already, consider hiring salespeople with a design background. [La-Z-Boy Furniture Galleries started hiring designers and saw their average ticket increase dramatically because the designers worked/consulted with consumers to come up with solutions rather than just sell 1 item]. Check out stores like TJ Maxx, Marshalls or HomeGoods to get some dramatic pieces to put on walls, to accessorize areas, to create window displays with. Target also has fun items. Make sure your bathrooms are nice! Definitely use them to showcase hard surface concepts, but also include delightful touches in there [nice soap, flower arrangement, etc.]. What you would add to this response? How would you create a retail experience that doesn't compete on price? Carpet and #flooring inspiration online fr Carpetright in UK and @ScarletOpus. http://bit.ly/d0sE8W Really changes #retailexp! Retailers get creative in NYT "retailers devise novel ways to revive sales" http://ow.ly/29YIY - what #retailexp ideas come to mind? For previous issues of Retail Experience In The News, see Part I and Part II. This article about sustainability [i.e., the 'greater green'] and the retail customer experience appeared in the November 23/30, 2009 issue of Floor Covering Weekly. 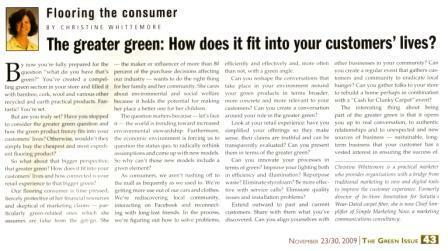 The Greater Green: How Does It Fit Into Your Customers’ Lives? By now you’re fully prepared for that question “what do you have that’s green?” You’ve created a compelling green section in your store and filled it with bamboo, cork, wool and various other recycled and earth practical products. Fantastic! You’re set. But are you truly set? Have you stopped to consider the greater green question and how the green product frenzy fits into your customers’ lives? Doesn’t that green flooring product actually represent more to them – possibly a solution to a greater green vision or aspect of their lives? Otherwise, wouldn’t they simply buy the cheapest and most expedient flooring product? So what about that bigger perspective, that greater green? How does it fit into your customers’ lives? And then, how connected is your [green] retail experience to that bigger picture? Our flooring consumer is time pressed, fiercely protective of her financial resources and skeptical of marketing claims – particularly green related ones which she assumes are false from the get go. She – the maker or influencer of over 80% of the purchase decisions affecting our industry – wants to do the right thing for her family and her community. She cares about environmental and social welfare because it holds the potential for making her place a better one for her children. At the same time, she realizes that many greater green solutions – like climate change – are beyond her control. And, too often the issues are so large that they overwhelm as do the plethora of product choices and claims. The result: she avoids decisions and postpones new flooring. However, she wants to be part of smaller human-scaled decisions and solutions which she can control. Given all of that, how can green be of benefit to you and your retail experience? How can you be part of a greater green world of importance to your customers? The question matters because – let’s face it – the world is trending toward increased environmental stewardship. We’re more aware that resources are limited, that our use of them has been irresponsible and wasteful, and that climate change is real. We’ve built up infrastructures that aren’t sustainable long term – kind of like the housing crisis. Overall, resources, including money, aren’t as readily available as they once were. Furthermore the economic environment is forcing us – individuals, municipalities and businesses alike – to question the status quo, to radically rethink assumptions and come up with new models. So why can’t those new models include a green element? As consumers, we aren’t rushing off to the mall as frequently as we used to. We’re getting more use out of our cars and our clothes. We’re rediscovering local and community, taking part in group hikes, interacting on Facebook and reconnecting with long-lost friends. In the process, we’re figuring out how to solve problems, efficiently and effectively and, more often than not, with a green angle. We are still spending, though. It’s just that we want our purchase decisions to stand for something and for our resources not to be wasted. Can you connect with this zeitgeist? Can you offer solutions? Can you reshape the conversations that take place in your retail environment around your green products in terms broader, more concrete and more relevant to your customers? Can you create a conversation around your role in the greater green? Look at your retail experience: have you simplified your offerings so they make sense, their claims are truthful and can be transparently evaluated? Can you present them in terms of the greater green? Can you innovate your processes in terms of green? Improve your lighting both in efficiency and illumination? Repurpose waste? Eliminate Styrofoam? Be more effective with service calls? Eliminate quality issues and installation problems? What about your organization, including employees and family: what matters to them? Extend outward to past and current customers. Share with them what you’ve discovered. Ask what matters to them? Can you align yourselves with other businesses in your community? Can you create a regular event that gathers customers and community to eradicate local hunger? Can you gather folks to your store to rebuild a home perhaps in combination with a “Cash for Clunky Carpet” event? Can you volunteer to help cleanup the Conasauga River? The interesting thing about being part of the greater green is that it opens you up to real conversation, to authentic relationships and to unexpected and new sources of business -- sustainable, long term business that your customer has a vested interest in ensuring the success of. Reviews result from love/hate. Merely satisfactory = indifference http://bit.ly/9YRHSk Your reaction to how this affects #retailexp? Love this: Social Networking Affects Brains Like Falling in Love http://su.pr/4V4EOr Think about the effect on #retailexp! Fascinating! Abercrombie bringing back its quarterly catalog 2 reconnect with customers http://bit.ly/dj8lTK. Time to focus on #retailexp! Changes ahead for housing: the suburban century is over http://bit.ly/bFWF6O How will it affect the #retailexp? NRF STores description & listing of top 100 retailers http://ow.ly/27TIN Any #retailexp surprises? teresting idea: Harrods teaming up w/academics to offer degree in sales http://bit.ly/b5cENV Shld be gd 4 #retailexp + empl motivation-No? Happy Canada Day to my Canadian friends! Happy July 4th weekend to my friends in the United States! 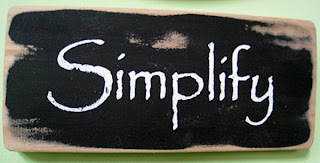 For all of you, here is the latest update from Simple Marketing Now for June 2010 with posts categorized into Social Media Marketing Resources and Simple Marketing News. I've included lots of resources for you in How Do I? Prepare For Social Feedback. This post details a terrific presentation on Twitter Success Stories From MarketingProfs Digital Marketing Mixer in October 2009. I recapped in Social Media For Business & Entrepreneurship - CBSAC/NY Panel Discussion. Thank you for reading and please do let me know if you have questions! Have a terrific month of July.